This is my version of carnitas, made with a pork shoulder, bone in. It’s sort of a Mexican version of pulled pork. I grew up in West Texas, so it was pretty common. 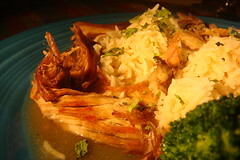 The traditional method is to start with a boneless version, and cut the meat into cubes before braising. 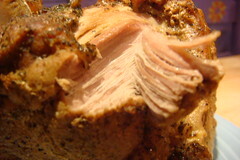 I find that starting with the bone in makes for a juicier more tender finished pork. (Save the bone for future pork stock making.) Also, I like to make a wonderfully spicy saucy gravy with the braising liquid. It seems wasteful and dumb to throw that out. Rub the pork shoulder all over with salt and ground pepper. Let it come to room temperature. Heat the oil in a heavy Dutch oven. Brown all sides of the pork shoulder, using tongs to turn from side to side. When all side are nicely browned, remove it from the pot. Add all of the vegetables to the pot, and cook for about 5-10 minutes, until the onions soften, and the mushrooms start to give off liquid. Add the pork stock and spices. Return the browned pork shoulder to the pot. Cover the pot and braise in the oven for 3½ hours. Turn the shoulder over from time to time. Cook until the pork is falling off of the bone. Remove the shoulder from the liquid and cover with aluminum foil. Once the meat is cool enough to handle, pull it from the bone, shredding it into bite-sized pieces. Or, who am I kidding — pull it off with two forks instead of using your fingers, so you can eat it faster! Discard large bits of fat — I add it to the vegetables and feed it all to my chickens. They love it! 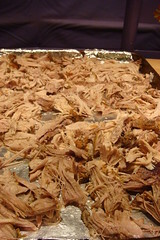 Put the shredded pork onto a baking sheet covered in foil and sprayed with oil. Cook until the meat is crispy and caramelized, occasionally turning the pieces over with a spatula. While the meat is crisping up, prepare the sauce by straining all of the vegetables and spices from the cooking liquid. Bring it to a boil, then add a slurry made from corn starch and water, just enough to the consistency of a clearish gravy. Serve the meat however you like! I like it wrapped in a flour tortilla with a little sauce and cheese. I love it served over rice, with refried beans on the side, or whole black beans mixed in. It makes a great filling for tamales, enchiladas or tacos. The meat is wonderfully spicy, a little hot/spicy and and very flavorful, the way I love it. The sauce is where most of the heat is, and it’s really tasty from having all those vegetables and pork braised in it for hours. Yum! what temp. should be used? Low and slow — 300 or 325 degrees F.